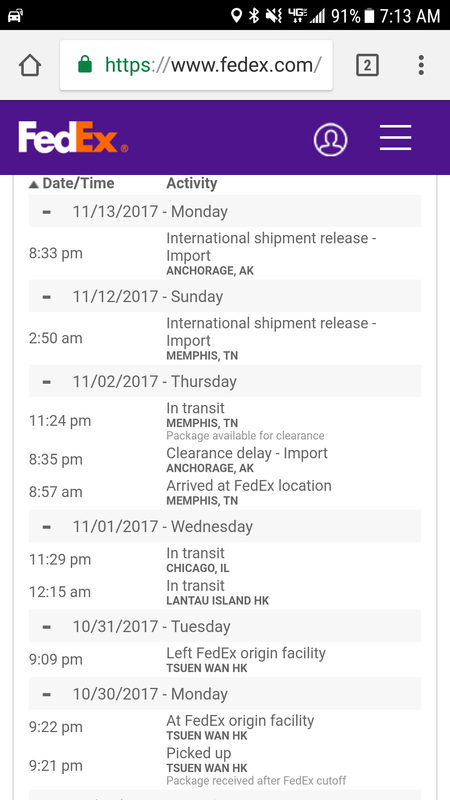 Hey guys just checked in with FedEx tonight my package still shows it’s in the Bondcage in Anchorage Alaska.The FedEx computer if use the tracking number says it’s out for delivery I went to my hold location which is also where they load the FedEx trucks and they double check for me it’s still in Anchorage probably with the rest of them they may clear for flight tomorrow morning. @all About 24 hours ago, we got the news that customs clearance for all the packages to the US was done. However, the FEDEX picked up the packages only a few hours ago. Please keep your phone accessible or contact FEDEX directly for the delivery details. Like we communicated 4 days ago, we sent you the wrong tracking number but the package was delivered correctly. We are sorry for the mistake and we know you were angry. However, respectful communication is expected here. Next time you want to swear, you can shout it out loud, but please don’t spell it out here. Thank you! USA: My Fedex tracking now shows that the package is local. It bounced to state/county/city facilities and is now “out for delivery” on a local Fedex truck. In theory will be here by 8PM … and this time it looks real. It was stuck in Alaska as of yesterday. But now has been updated through Memphis all the way here. Better yet: It just arrived! Mine just arrived about an hour ago. I had to assemble it and start my first print before I posted. Very happy so far. Glad to hear that! Eventually they will locate Rhode Island, but at least now, I know that the problem is with FedEx and not customs. Enjoy and thanks for the feedback! Are you still in contact with fedex? What is the latest update? I haven’t seen any change on the tracking since the 13th. Hi! Mine was that easy until early today then it updated and said out for delivery. It arrived 4 hours after the update. I never did get a call back on the trace. I live in Rhode Island. The shipment appeared to have gone through Indiana to Mass, then to RI. I hope you get yours by Friday. Just checked. Only 7 packages are being delivered. All the others are safe and sound in there home. Please PM me your backer number. I will check it for you. FYI: From a shipping box standpoint, it seems more like a large screen laptop box. Whereas printers are more like a cube, this comes flatpacked and unassembled. If I had to describe it, the actual box looks like it could have a monitor or two laptops in it. Generic Cardboard box, no markings: 19"x32"x6"
Sorry, I mistook you for another person. Please wait. The logistics company is checking what happened. We will get back to you when we have updates about it. Sorry for the waiting. The person I spoke to said they lost it in Memphis TN. My colleague Sheila is communicating with FEDEX. She said FEDEX lost the package and they are looking for it. We will keep you informed here or through email. They need additional information to deliver me. What is your TFN (Tax File Number)? What is your Backer Number for our Kickstarter project? What is your email address that associates to your Kickstarter account? However for ID Number, what is it? my ID card number ??? The Backer Number where do I find it?